﻿The ﻿Richmond ﻿Lions ﻿Club ﻿is ﻿a ﻿group ﻿of ﻿individuals ﻿in ﻿the ﻿Richmond, ﻿Indiana ﻿area ﻿who ﻿meet ﻿twice ﻿a ﻿month ﻿at ﻿Golden ﻿Coral ﻿Restaurant ﻿on ﻿East ﻿Main ﻿Street. ﻿The ﻿Richmond ﻿Lions ﻿Club ﻿was ﻿established ﻿on ﻿October ﻿5, ﻿1924. ﻿The ﻿Richmond ﻿Lions ﻿Club ﻿is ﻿a ﻿part ﻿of ﻿Indiana ﻿District ﻿25-F ﻿of ﻿Lions ﻿Club ﻿International. ﻿Lions ﻿club ﻿members ﻿perform ﻿service ﻿projects ﻿focused ﻿on ﻿improving ﻿our ﻿communities ﻿and ﻿have ﻿the ﻿opportunity ﻿to ﻿participate ﻿at ﻿the ﻿district ﻿and ﻿international ﻿levels. 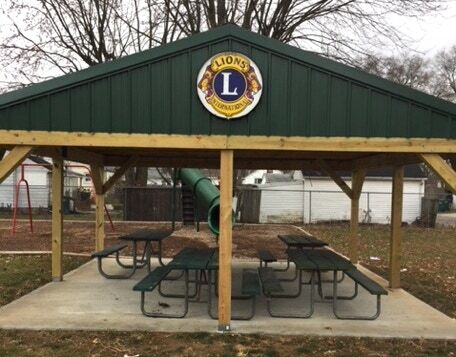 ﻿In ﻿addition ﻿to ﻿supporting ﻿district ﻿officers, ﻿the ﻿Richmond ﻿Lions ﻿Club&apos;s ﻿members ﻿participate ﻿in ﻿district ﻿projects ﻿such ﻿as ﻿Camp ﻿Woodsmoke, ﻿along ﻿with ﻿state ﻿and ﻿international ﻿projects. • Lions are changing the world one community at a time, by addressing needs at home and around the globe and believe that kindness matters. And when we work together, we can achieve bigger goals. • Lions Clubs International is the world&apos;s largest service club organization, with a network of 1.4 million men and women in more than 210 countries and geographical locations. We serve where we live, as well as globally, and we have fun doing it. • Though well known for its successful initiatives in vision health, Lions service is as diverse as its members. We meet all sorts of needs, from assisting the elderly to helping victims of natural disasters. • Lions make a difference everyday everywhere. Whether by organizing a pancake breakfast fundraiser or building a wheelchair ramp for someone in need, we are a hands-on organization. • Lions extend their reach to local communities, to districts within the state, to state and internationally. The needs are great and our services are broad, including sight, health, youth, elderly, the environment and disaster relief. ﻿Pictures ﻿tell ﻿the ﻿story! ﻿1 ﻿out ﻿of ﻿20 ﻿preschoolers ﻿and ﻿1 ﻿out ﻿of ﻿4 ﻿school ﻿aged ﻿children ﻿has ﻿an ﻿eye ﻿problem ﻿requiring ﻿treatment ﻿or ﻿correction. ﻿Since ﻿children ﻿do ﻿not ﻿know ﻿how ﻿well ﻿they ﻿should ﻿see, ﻿they ﻿will ﻿not ﻿complain ﻿about ﻿poor ﻿vision. ﻿Eye ﻿disorders, ﻿if ﻿they ﻿remain ﻿undiscovered, ﻿can ﻿harmfully ﻿affect ﻿a ﻿child&apos;s ﻿personality, ﻿his/her ﻿learning ﻿ability ﻿and ﻿his/her ﻿entire ﻿adjustment ﻿in ﻿school. ﻿Nearly ﻿half ﻿of ﻿the ﻿50,000 ﻿Americans, ﻿who ﻿go ﻿blind ﻿each ﻿year, ﻿lose ﻿their ﻿sight ﻿needlessly. ﻿By ﻿conducting ﻿screening ﻿tests, ﻿the ﻿adult ﻿vision ﻿screening ﻿program ﻿will ﻿identify ﻿subjects ﻿at ﻿high ﻿risk ﻿for ﻿eye ﻿disorders ﻿or ﻿potentially ﻿blinding ﻿diseases ﻿and ﻿refer ﻿them ﻿for ﻿professional ﻿eye ﻿care. ﻿Many ﻿adult ﻿diseases, ﻿such ﻿as ﻿glaucoma ﻿and ﻿diabetic ﻿retinopathy, ﻿can ﻿steal ﻿a ﻿person&apos;s ﻿sight ﻿without ﻿noticeable ﻿symptoms. ﻿Any ﻿vision ﻿that ﻿is ﻿lost ﻿to ﻿these ﻿diseases ﻿cannot ﻿be ﻿restored, ﻿but ﻿further ﻿loss ﻿can ﻿be ﻿prevented. ﻿An ﻿adult ﻿vision ﻿screening ﻿can ﻿often ﻿detect ﻿these ﻿problems ﻿in ﻿the ﻿early ﻿and ﻿treatable ﻿stages. ﻿This ﻿is ﻿a ﻿screening ﻿only ﻿and ﻿should ﻿not ﻿be ﻿confused ﻿with ﻿a ﻿complete ﻿eye ﻿examination. ﻿No ﻿diagnoses ﻿will ﻿be ﻿made. ﻿Based ﻿on ﻿an ﻿individual&apos;s ﻿screening ﻿results, ﻿the ﻿volunteer ﻿screener ﻿will ﻿recommend ﻿to ﻿that ﻿individual ﻿if ﻿he ﻿or ﻿she ﻿should ﻿have ﻿a ﻿complete ﻿eye ﻿examination. ﻿(Each ﻿individual ﻿may ﻿choose ﻿the ﻿health ﻿care ﻿professional ﻿of ﻿his/her ﻿choice ﻿for ﻿any ﻿medical ﻿care, ﻿further ﻿advice, ﻿and/or ﻿verification ﻿of ﻿the ﻿screening ﻿results). ﻿The ﻿screenings ﻿will ﻿include ﻿a ﻿visual ﻿acuity ﻿test ﻿(both ﻿far ﻿and ﻿near ﻿vision ﻿on ﻿each ﻿eye). ﻿Other ﻿eye ﻿problems ﻿may ﻿also ﻿be ﻿discovered ﻿during ﻿the ﻿screening. ﻿When ﻿Helen ﻿Keller ﻿spoke ﻿to ﻿the ﻿International ﻿Convention ﻿of ﻿Lions ﻿International ﻿in ﻿1925 ﻿she ﻿challenged ﻿the ﻿Lions ﻿to ﻿become ﻿the ﻿"Knights ﻿of ﻿the ﻿blind". ﻿Committed ﻿to ﻿our ﻿motto ﻿- ﻿"We ﻿Serve" ﻿Lions ﻿perform ﻿service ﻿projects ﻿focused ﻿on ﻿improving ﻿our ﻿communities, ﻿the ﻿state, ﻿the ﻿nation ﻿and ﻿the ﻿world. ﻿There ﻿are ﻿many ﻿local ﻿community ﻿philanthropic ﻿efforts ﻿that ﻿the ﻿Richmond ﻿Lions ﻿Club ﻿has ﻿supported ﻿over ﻿the ﻿years ﻿that ﻿do ﻿not ﻿relate ﻿to ﻿its ﻿mission ﻿but ﻿are ﻿equally ﻿important ﻿to ﻿improving ﻿our ﻿community. ﻿Over ﻿the ﻿94 ﻿year ﻿history ﻿of ﻿the ﻿Richmond ﻿Lions ﻿Club, ﻿the ﻿club ﻿has ﻿served ﻿in ﻿a ﻿variety ﻿of ﻿ways. 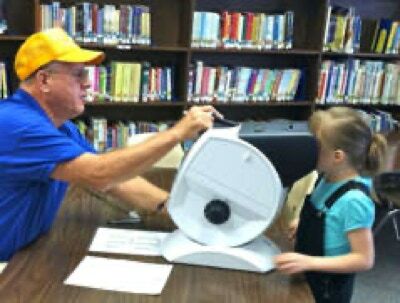 ﻿A ﻿major ﻿service ﻿project ﻿of ﻿the ﻿Richmond ﻿Lions ﻿Club ﻿is ﻿Vision ﻿Eye ﻿screening ﻿of ﻿both ﻿preschool ﻿and ﻿school ﻿aged ﻿children. ﻿Last ﻿year ﻿in ﻿Richmond ﻿Community ﻿schools ﻿alone, ﻿the ﻿Club’s ﻿screening ﻿team ﻿screened ﻿more ﻿than ﻿1143 ﻿children ﻿plus ﻿many ﻿more ﻿in ﻿surrounding ﻿areas. ﻿Lions ﻿screen ﻿the ﻿1st, ﻿3rd, ﻿5th, ﻿and ﻿8th ﻿grade ﻿students, ﻿enabling ﻿children ﻿to ﻿have ﻿the ﻿vision ﻿needed ﻿to ﻿be ﻿successful ﻿in ﻿school. ﻿In ﻿addition ﻿to ﻿our ﻿focus ﻿on ﻿vision, ﻿the ﻿Richmond ﻿Lions ﻿Club ﻿has ﻿also ﻿supported ﻿the ﻿following ﻿organizations ﻿in ﻿the ﻿local ﻿community ﻿as ﻿well ﻿as ﻿Indiana, ﻿nationally ﻿an ﻿International. ﻿• ﻿Richmond ﻿Area ﻿Rose ﻿Garden ﻿- ﻿Lions ﻿maintain ﻿a ﻿bed ﻿as ﻿well ﻿as ﻿volunteer ﻿to ﻿park ﻿cars ﻿at ﻿the ﻿annual ﻿First ﻿Bloom ﻿and ﻿Glow ﻿event ﻿as ﻿well ﻿as ﻿the ﻿Chocolate ﻿Garden ﻿sponsored ﻿by ﻿the ﻿Richmond ﻿Symphony ﻿Orchestra. ﻿If ﻿your ﻿organization ﻿is ﻿looking ﻿for ﻿funds ﻿that ﻿fall ﻿within ﻿the ﻿mission ﻿of ﻿our ﻿club, ﻿CLICK ﻿HERE. ﻿We ﻿have ﻿established ﻿a ﻿philanthropic ﻿committee ﻿that ﻿will ﻿review ﻿any ﻿requests ﻿submitted ﻿to ﻿the ﻿club. 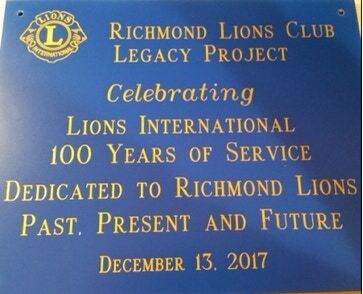 The Richmond Lions Club was organized June 7, 1924 and officially chartered on October 5, 1924. The 38 original members voted to meet every Wednesday at noon with a luncheon. The club met at a local restaurant until 1927 when it moved to the Leland Hotel. In 1972 the meeting was moved to Holiday Inn and to Millers Cafeteria in 1992. In 1996, the club moved to MCL Cafeteria. 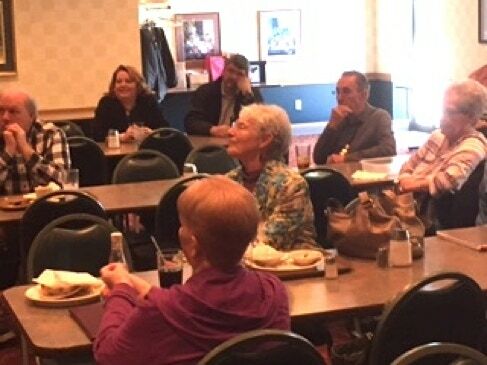 The club currently meets at Golden Corral Restaurant. In 1938 the club sponsored Fred Craft and his stand at the post office. Fred became a Lion and he and his faithful dog attended every meeting. In 1939 Paul Mendenhall and Judge Brubaker attended the International Convention in Pittsburgh. The next year 2 more delegates from the club attended in Havana Cuba. The club hosted two state conventions, the first in 1940 and again in 1966. The club has had four District Governors, Wilfred Bucher in 1957-1958, H. R. Smith in 1967-1968, Jack Buckland in 2002-2003 and Wayne Karanovich for a partial term in 2016. The first home show was held in 1953 in Clear Creek Park. After 5 years at the park,, inclement weather caused the club to move the show to the Trueblood Fieldhouse on the Earlham College campus. In 1983, the show was moved to the Kuhlman Youth Center at the Wayne County Fairgrounds. This 60 year tradition continued until being replaced in 2013 by our current biggest fund raising efforts, our participation as one of the leading Non-Profit members of the InCONCERT Richmond series. In 1970, the Grapefruit Project was started and has proven to be a great fundraising project over the years. The Richmond Lions Club has continued to grow throughout the years in service to the community. Today the club is very active and civic minded, proud of its heritage and of membership in the club and community. The Richmond Lions Club lives up to its motto - "We Serve". ﻿INSIDE ﻿TO ﻿OUTSIDE ﻿INITIATIVE ﻿- ﻿PRISON ﻿PUPPY ﻿RAISING ﻿PROGRAM. ﻿It ﻿tells ﻿the ﻿story ﻿of ﻿Leader ﻿Dogs ﻿from ﻿puppyhood ﻿to ﻿sighted ﻿partner ﻿and ﻿how ﻿the ﻿dogs ﻿are ﻿raised ﻿to ﻿be ﻿service ﻿dogs. • InCONCERT - this series is a group of local non-profits who collaborate their efforts to bring entertainment to the local community with all proceeds going to the participating non-profits. Tickets for InCONCERT events can be obtained from any Lions member. CLICK HERE TO BE AN INCONCERT SPONSOR! THE MELVIN JONES FELLOWSHIP RECOGNIZES DONATIONS OF $10,000. It is the backbone of LCIF, providing seventy percent of the Foundation&apos;s revenue. As a recognition of humanitarian work, an MJF is an honor presented to those who donate $1,000 to LCIF or to people for whom a donation was made by others. Melvin Jones Fellows receive an attractive lapel pin, a plaque and a congratulatory letter. W.P. WOODS FELLOWS - The mission of the Indiana Lions Foundation is to assist Indiana Lions Clubs, Subdistricts of Indiana Lions and state projects of multiple District 25 to carry out their charitable purposes. The W.P. Woods Fellow is the highest award that can be presented from the State of Indiana Lions. Dr. W.P. Woods, of Evansville, Indiana, was elected as the first president of Lions International Association. Each W.P. Woods Award costs $500 and is paid to the Indiana Lions Foundation. Do you want to help and serve others in the Richmond, Indiana area? Are you interested in making our communities better for future generations? Then you should become a member of the Richmond Lions Club! To join, simply click the button below and email it to our club secretary or contact a club member. Lions International is the world&apos;s largest service club organization with a network of 1.4+ million men and women in more than 210 countries around the world. We serve where we live, as well as globally, and we have fun doing it! Through well known for its successful initiatives in vision health, Lions service is as diverse as its members. We meet all sorts of needs, from assisting the elderly to helping victims of natural disasters. Lions give funds raised to causes that support our mission and community. All our administrative costs are covered by dues and in club activities. Lions make a difference everyday everywhere. Whether by organizing a pancake fundraiser or building a wheelchair ramp for someone in need, we are a hands-on organization.